The KONG Wobbler is an irresistible, challenging and robust dog toy. It is a good alternative for dogs that eat too quickly. 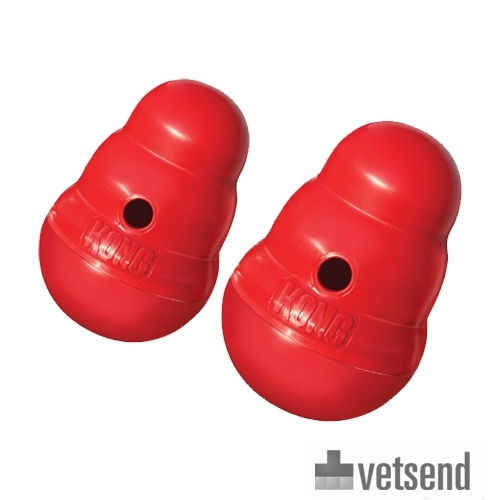 With KONG Wobbler, dogs will eat more slowly and are playfully engaged. The Wobbler is a toy and an upright food bowl combined. It is the same shape as the KONG Classic, but works in a different way. Your dog taps the Wobbler to get food out, and the Wobbler makes unpredictable movements, so it is always a challenge for your dog to get the food out. The Wobbler always returns to the same upright position, due to the weighted base. It is an alternative to a normal food bowl, as it helps to extend the time spent eating and your dog also gets more exercise. Simply turn the Wobbler to open it and add food. Have you used KONG Wobbler before? Let us know what you think about this product.